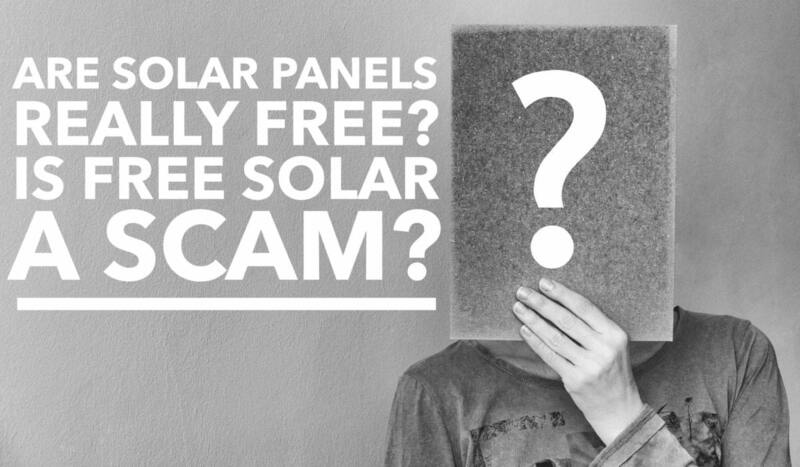 Q: Are solar panels really free... or is free solar a scam? If you’ve been researching solar panel system, you’ve probably heard at least one company advertise ‘free solar panels’ or seen ads that start with "U.S. Government Pays Middle Class Families to Go Solar" or "New Jersey will pay you to install solar" --- These ads are typically lead capture scams to sell your information to solar leasing companies! Here's the deal: There is no such thing as a free lunch (or a free solar panel installation). Free solar panels’ are not actually free; you will pay for the electricity that they produce, usually under a 20 to 25 year solar lease or power purchase agreement (PPA). The term ‘free solar panels’ is typically used to advertise solar lease or solar power purchase agreements (PPAs). Under both of these arrangements, a leasing company will put solar panels on your roof for no money up-front, but will charge you for the electricity that they produce. Ask what brand panels and inverters they will be using (because the “free installation” generally includes lower quality materials). Make sure that you understand the details of your lease agreement. Regardless of the up-front costs, you will be required to pay the leasing company between $0.10 and $0.17 for every kilowatt hour of solar electricity that your installation produces. While this has the potential to save you money in the long run, check the installers financial assumptions before you sign up. Many installers are estimating that electric prices will increase by 5% a year, when the historical average has only been about 3.8% per year in New Jersey. Understand what you will be “giving up” to the leasing company. Typically, you will lose your federal tax credit, any available rebates, and all of your potential SREC income. Remember that you don’t own the solar panels on your house, the leasing company does. Ask what could happen to your solar panels if the leasing company goes out of business. Since the panels are considered to be an asset of the leasing company, can they be liquidated in the event of bankruptcy? Will their creditors remove them from your house? The Solar Panels On Your Roof ARE NOT Yours! The reality is that you do not own the solar system (or the SRECs), and the solar energy that the panels produce is not free. Under solar lease agreements or PPA, ownership is retained by the solar company, and you pay for the electricity it produces. In essence, the company has built a small power plant on your roof and is selling you the electricity. And you must buy it from them for the entire 20-25 year term. What are the Major Pitfalls of "Free Solar"? Homeowners that sign solar PPAs or leases sign long-term lease agreements (anywhere from five or 20 to 25 years) and make monthly lease payments to the provider that typically amount to a little less than their current utility bills. At the end of the lease's term, homeowners can opt to purchase the system outright, or the solar leasing company can reclaim and remove the system. PPAs and solar lease-installation companies typically include several important assumptions and contingencies into solar lease agreements, clauses or sections that can have a large impact on the ultimate value, and return on investment, that goes to the lessee (the home or property owner). PPAs and solar leases also typically incorporate what's known as rate escalators. Monthly payments are forecast increases in the cost of local grid electricity and rise along with them – hence the term price escalators. As a result, the customer in some instances could wind up paying more over the 20- or 25-year term of a residential solar lease than they would have paid a utility for electricity over the same period of time. Furthermore, PPO solar lease-installation companies retain ownership of the ITC, as well as your SRECs. A recent article lists experiences of homeowners who have had a solar lease and faced various challenges when attempting to sell a house. That’s because instead of owning them the leased the panels the the new owner of the house is required to assume a lease contract. Many sellers need to shave the asking price by the remaining cost of the lease (remaining lease term x monthly payments), to draw in buyers unfamiliar with the financing arrangement. Read More in this article By Will Wade, Bloomberg. Solar lease will NOT add value to your house because they are the personal property of the leasing company and not a fixture on your house. In fact, a solar lease or PPA can devalue your house. In general, people who own rooftop solar enjoy an added value to their home but not with the leases. Buyers shy away from them because they straight out don’t like the deal or simply do not understand it. Some appraisers say that to many potential buyers a solar lease is a liability rather than an asset, and may drive people away. In the Bloomberg article, Dorian Bishopp blames the solar panels on his roof for costing him almost 10 percent off the value of the home he sold in March. According to the Bloomberg article Scott Vineberg, a SolarCity customer, received multiple offers for his home in Scottsdale, Arizona, home he sold in January. Unfortunately, the lease made the deal more complicated because the buyers were reluctant to take over the contract and asked him to pay off the balance in advance, that is 10 years of payments. Because of the lease escalator, it is entirely possible that over the twenty year lease, you’ll reach a point where you’re spending more on the lease than you would if you received a bill from your utility company. Also, if your consumption goes down, you are on the hook for making the loan payments. For example, we all know the family components of the house change. If you get into a lease when you have a large family and then your family reduces in size the lease costs now does not outpace your energy. The lease payment is more then the average electric bill because it was done on data when more people were in the home. In addition, it is a mistake to assume energy prices will go up over the next 20 years. Better energy technology, both from fracking and renewables, should increase supply and reduce costs over time. Forget Leasing! How about financing your system instead? The revolutionary thing about solar leases was that they made it possible for virtually anyone with a roof to go solar. Solar leases were crucial in removing barriers to entry back when solar system prices were prohibitively high. But times have changed! Solar prices have plummeted in the last 5 years. and financing options other than solar leases have become viable. The most important of these is the solar loan. With our SolarBase Program, we can provide homeowners with $99 down financing options with 5, 7, 10, 12, 15 and 20-year term options along with the benefits of system ownership. So before you sign up for the first ‘free solar panel’ deal that comes your way, make sure you understand what you’re being offered and that you’ve considered our SolarBase Program. Please click on Get an Estimate for details on how much "owning solar" can save you.